Cisco (s csco) is giving up on its barely two-year-old $590 million purchase of Pure Digital Technologies, announcing today that it is closing its Flip business unit and cutting 550 employees as part of a larger restructuring. The move comes after clear signs that the outsized deal was not paying off for the technology giant, which is in the midst of refocusing its business on its core networking business. Cisco said it will close the Flip business, but will continue to support current Flipshare customers who upload and share media to the web. Cisco said it will also refocus its Home Networking business to make it more profitable and connected to the company’s networking infrastructure. It will also move Umi, its consumer Telepresence, into the business Telepresence line and sell it through an enterprise and service provider go-to-market model. 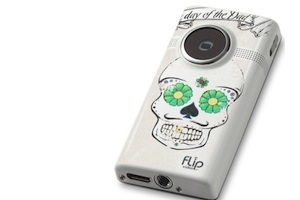 The closure of the Flip unit comes a couple months after former Pure Digital CEO Jonathan Kaplan left Cisco, prompting questions about the direction of the Flip line of video cameras. Cisco bought Pure in March of 2009, saying the purchase was about extending its presence into the consumer electronics business. The company was also looking to use Pure’s smarts in simple consumer electronics design to rework its home networking business. While the deal has helped Cisco create a new line of more consumer friendly home routers, it didn’t really change the company much, a task that Om mentioned recently is incredibly hard for large companies. And it hasn’t resulted in a big revenue driver in video cam sales. That’s because while Flip grew fast with its single purpose design, which managed to move millions of units, its continued growth was checked by the rise of smartphones that can increasingly shoot HD video while offering more wireless sharing options, something Flip’s camera’s never included, an irony for a networking company. Another new consumer business, Umi, a home video conferencing product, has also failed to capture a lot of buzz, in part because of its high price. With Kaplan headed toward the door, we speculated that the deal for Pure had turned into a flop. Now it appears that Cisco is making that conclusion official. CEO John Chambers earlier this month laid out a major reorganization for the company in a memo to employees outlining how the company would refocus on five areas: core routing, switching and services; collaboration; architectures; and video. While Chambers said Cisco would still focus on video, it appears he was not referring to Flip. This deals a major blow to the idea of a single-purpose simple video cam, which may still have a niche place in the market. But while Cisco jettisons Flip, and admits defeat, the move shows the company is clearly serious about retrenching and getting back to basics. You have to watch the marketplace *CONTINUOUSLY*. If you ever *START* to see video cameras being put into nearly ever cell phone… you stop making stand-alone video cameras. You don’t wait until MILLIONS of cell phone cameras are out there… and then “oh, gee, maybe we should do something now”. Flip could have been the (41mn) color of video. what a missed opportunity. While Chambers said Cisco would still focus on video, it appears he was not referring to Flip. This deals a major blow to the idea of a single-purpose simple video cam, which may still have a niche place in the market. Oh, this bodes well… Instead of at least selling the Flip division and recovering some of the money, (or all of it because it WAS profitable,) Chambers throws out the baby with the bathwater. Maybe he should have thrown out the divisions that WEREN’T making money instead, but that’s just me, being silly like a shareholder. The age of relying of routers to be glamourous investments is so 1990’s. They’re now infrastructure; cheap, reliable not so much, cheap, buried along with the water pipes, cheap, ubiquitous, cheap. You don’t get rich being in the infrastructure category. Instead, CISCO is “focusing on its core competencies” and “rededicating its efforts” just like all the loser companies try, shortly before they get all their bits sold off by some corporate raider. I’ve seen this scenario enacted dozens of times over the years. I even worked for some, until they went bankrupt. So I hear phones have cameras on them now? What’s all this? It was obvious before Cisco purchased Flip that the market it had created would become popular, filled with alternative products and commoditize like crazy. And of course that simple video cameras would be incorporated into Smart Phones (the iPhone 3G with a 2mp camera but no video had come out a year earlier) and would eventually make this market difficult. Then of course there’s the problem that Cisco is a gigantic company, and is used to very healthy margins on their products, something that wasn’t going to be possible with Flip. So… why did they EVER purchase Flip? I have no idea. As others have said they must be totally clueless. Then look at the execution. As others ate away at the flip market with video stabilization and waterproof cameras and on and on did Flip come out with anything new after the acquisition? No, no they didn’t. Clearly Cisco broke the company once they acquired it. They didn’t even do the things you’d think Cisco would do, like introduce a model with networking built in. Instead they introduced that horrible Slide model. Chambers should be ashamed of himself. All those jobs lost. And for what? You think Cisco is refocused? While they are still messing around with the pointless Cius and continue pretending that there’s a consumer market (even through ISPs) for the nearly as pointless Umi? C’mon. Don’t kid yourself. If Cisco were serious ALL of these products would be dead. Cisco hoped to gain by growing a maket for high bandwidth video data being moved across their network services. It’s a shame that Cisco would close the business unit as opposed to selling a popular product. They do have a history of poorly integrated acquisitions. The Flip group was never integrated into Cisco (or Linksys). They had a separate reseller program that required a very steep financial commitment. The good news is that there are other products out there that have caught up, if not surpassed, Flip in quality and functionality – including the Sony, Sanyo (http://goo.gl/h5Wt6) and Kodak (http://goo.gl/K9bgf). I thinkbthe should at least sell it not shut it down there goes the youtube community . Most of us use it since smartphones can’t record and share large files so flip is a great thing !! $590 million divided by $16.23 = 36,352,433 Cisco shares being exchanged for all the shares of Pure Digital. So it appears that Cisco’s true cost in purchasing Pure Digital was $747 million, $157 million more than announced by Cisco. Furthermore, before Cisco CTO Padmasree Warrior was hired by Cisco, she was the CTO of Motorola and dismissed in her blog the introduction of the Apple iPhone. However within 9 months of the Apple iPhone’s introduction, Motorola sales had collapsed by more than $4 billion and Motorola operating earnings dropped $3.8 billion to a loss of $534 million, leaving Warrior with absolutely no future as the CTO of Motorola. In my opinion, Warrior is now repeating her Motorola failure at Cisco. Amazingly, Cisco CEO John Chambers promoted Warrior to the position of Cisco Senior Vice President and General Manager, Enterprise, Commercial and Small Business. I mean, it’s time for John Chambers termination! If Cisco’s Board of Directors fail to terminate Chambers you can count on Cisco’s shareholders to do it for them. Brad, I couldn’t get to vote to fire Chambers (or the board), so I sold all of my shares of Cisco instead a couple months ago. Richard Zeta acquisition may also go the same route. I have not seen anything from Cisco in building management and controls after that acquisition. hmm, for how long? this is why i don’t buy non-apple tech. (i almost bought a flip this past autumn, but instead i went with an iphone 4). 99% of consumer tech companies are short sighted and have no vision (except the bottom line). it’s been going on for 40 years and shows no sign of stopping. the flip was a good product. however, i would be feeling burned right now had i bought one. Left on its own Flip might have innovated it’s way past the cell phone competition. in a way that GoPro has. Big corporation’s shouldn’t buy and then suffocate small companies. I couldn’t agree more. Cisco should at least try to sell that unit off. Someone could really use that technology, which doesn’t compete with Cisco’s function in the slightest. And Cisco would clear some money out of the deal as well as not have to pay shutdown costs. Yeah, that’s not how these things work. 99% of those employees got nada, nothing, zippo. Only a few (single digits) employees plus the VCs that funded the thing, and of course the bankers, ever make any money from these things. Who could have foreseen the rise of video cams on smartphones? Certainly not a guy who supported a president who couldn’t foresee New Orleans getting flooded when the levy broke. Flip had no unique technology and no barriers to entry for competitors. They had a brand name, and a minor one at that, and Cisco paid almost $600 million for it, using other people’s money. How could they not have seen that video capture could be easily added to phones, at a small cost, and nobody needed to buy a device that wasn’t a better camera? This wasn’t just a little mistake, it’s evidence of cluelessness. But in a way, it’s not all the fault of Cisco management. If they were allowed to distribute profits without dilution by taxes, maybe they wouldn’t feel so forced to maintain unsustainable growth, and would focus on things they understand, rather than delude themselves into believing they could extend their success in enterprise and carrier networking to consumer gadgets. To keep their current jobs, the management obviously feels obligated to grow the company faster than the markets they understand can grow. Maybe it’s not too late to cancel that tablet product. I honestly think Flip had potential. It’s not clear what the interconnected future will look like, it could very well include single purpose devices with built in connectivity. Cisco probably still wasn’t the right steward for Flip, but I think the Flip brand has value left. Umi is in a similar spot. It’s not a terrible choice to end it, but when you invest in new brands and a new business, you should demonstrate a little perseverance while it has life. Look at what perseverance did for niche products like the ipod, the playstation, the Mini, the Blackberry. Or at least extract some value…even the kill was mis-execute. why not spin it off or sell it? I disagree. I am pretty sure they very well foresaw the short life line of hand-held video gadgets but still thought of pushing forward to make a quick buck (& failed). Like how hand-held GPS did 8-12 yrs ago; GPS receivers was available as a PDA add-on back then as well. that’s not how companies think and plunk down $590M. That kinda $ is not spent to make a quick buck. Its got to be strategic, synergistic and financially viable. I am not sure what New Orleans or Katrina has to do with this? An idiotic comment for sure. It does not sound like Flip is a failure. Just sounds like Cisco did not know what to do with it. I do wonder if they shopped Flip to someone like HP or Kodak or some other comsumer electronics company. I hate to see 550 people lose their jobs simply because the company that acquired them does not know what to do with it. I know the iphone does a great job, i know i love mine, but I believe this closure willl leave a void in the marketplace for a single purpose video product like this. After Katrina flooded New Orleans, the then-president of the US declared that nobody could have foreseen it (the flooding), even though it was almost guaranteed by anyone with a scientific background who had studied the the area (a report predicting the flood actually came out just prior to the hurricane). It just so happens that the CEO of Cisco had endorsed (and financially supported) both campaigns of that president, even though it was obvious to most that the president’s abilities to understand semi-complex issues was challenged, to say the least. I made the connection because it should have been obvious to any technology executive in 2009, especially one who runs a giant and complex company like Cisco, that Flip was a fad, with no technological or market barriers to protect it, and certainly not worth $600 million. The price could not be justified on earnings alone, and there was no reason to believe the acquisition would provide any strategic or synergistic advantage to Cisco. So while maybe Chambers couldn’t have foreseen that, lots of other people did. I’m not saying Flip is a failure, but it definitely wasn’t worth the price Cisco paid for it, so the acquisition is definitely a failure. You have to winder why a division like Flip needed 550 workers, for it’s not as if they built the cameras themselves. It doesn’t take hundreds or engineers to design it, so what were all those people working on? It sounds like there are other similarly positioned video cameras on the market, some with more features and better performance, at a lower price. So there will only be a void if the country runs low on over-priced gadgets. I get it. You hate GW Bush and John Chambers in part because he supported GW Bush. To be fair to GW, every president of the last 50 years has ignored the problems that led to the levy burst in NOLA. The current president, whom I assume you worship, ignored Louisiana when the BP oil spill took place, in part, I am sure because BP was one of his largest contributors. In the end, I am sure GW is no dumber than the current president, so we will leave it at that. So to get back on topic and leaving aside who John chambers supports in an election, it probably was a bad idea for cisco to acquire flip, but not for the reasons you state, but because cisco had no business owning such a company. You say the flip is a fad, but says who? It seems to be a popular product and it’s minimalist feature set seems to be popular for people that need simple in their tech products. Though flip may not be doing as well as previously may have nothing to do with them, but everything to do with their inept overlord. I have no idea how many people it takes to run a business like flip, but if it is bloated, it is probably cisco that bloated it with initiatives that took it away from its core business model. I am sure they could continue to run a lean and profitable company without cisco. So we agree it was a bad move for cisco to buy it if they did not know how to run it, and it was probably a bad idea for flip to sell other than the fact it made the owners very rich. With that said, it just seems like a perfectly fine product is going away needlessly and the deal was probably very bad for the employees being laid off that did not get rewarded with stock from the deal. I wasn’t critical of Bush for ignoring the threat to NO (for as you point out, all politicians do), but rather because he tried to deflect blame for doing nothing in the aftermath for more than 5 days, by saying “nobody could have foreseen what happened”. Lots of people did foresee what happened, he just wasn’t one of them (and no, I do not worship the current president, I wasn’t aware that criticism of one person automatically means you believe his/her political opponent is above criticism). But Obama didn’t ignore NO after the BP oil spill, although he certainly didn’t apologize to BP for being very critical of them, as Republican congressmen did. Maybe you can expand on the wrong reasons I gave for Flip being a bad acquisition for Cisco. as they don’t seem much different than yours. Flip is a fad because their model is not repeatable nor sustainable. If it were a trend, there would be lots of competitors. And I wouldn’t necessarily blame Cisco for any failings of the division, if they have 550 employees, it sounds like they were allotted enough resources to grow that business into something that would last beyond USB video cams. I don’t think it was a bad idea for the owners to sell – they got a great price for it (disclosure: I had founded a company in the 90s that was acquired for a good price, and subsequently run into the ground by the buyer, but never regretted the deal for a second.). If the division is still profitable, I don’t understand why Cisco doesn’t spin it out or sell it – a $300M company with profits should be worth something, but maybe that says something about the tax code or John Chambers (who, btw, I don’t hate, but have little respect for, as he believes low taxes trumps every other issue he feels strongly about, as evidenced by his political activities, and is not the right guy to run what is effectively a conglomerate). It is not so much the “wrong” reason, but the premise you are operating under that the Flip is a fad. I just disagree with your assertion that it is a fad. I want to point out I have never owned a Flip, but I know MANY people who do and almost all of them STILL use them. Despite the “convergence” devices, the single use product still has a place and the Flip appears to be a leader in that space. I personally think a camera like the Kodak Zi8 is a better camera than the Flip, for me, because it has more features, but many people that I know that like the Flip, do so precisely because it DOES NOT have those features. I think no one has really captured the simplicity of the Flip and I think the market for that product still exists considering we live in the age of youtube, so I do not think it is a fad. I more or less agree with you on the other stuff. I certainly have nothing against the Flip owners for selling. If Cisco flashed the money in front of me, I would have grabbed it too. All I was saying it was not a good move in the end for Flip as a company if they wanted it to continue as a business. And it was a bad deal for any employees that got the pink slip because Cisco arbitrarily shut it down. As to why they shut it down instead of selling, my theory is they would rather kill it than see it succeed under someone else’s management, because it would prove your theory that Cisco management is incompetent. They probably do not want that.